The Rutgers University Pinelands Field Station welcomes faculty and student research from throughout the Rutgers system, and from other institutions and organizations who want to work in or around the Pine Barrens. The station and personnel provides a resource for Graduate Students in the Rutgers Department of Ecology, Evolution and Natural Resources and Rutgers University–Camden, Graduate Program in Biology. Undergraduate interns work with us throughout the year. 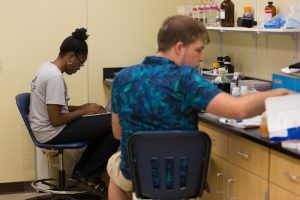 Some students engage in projects with a Pinelands Station mentor for college credit at Rutgers or at their home institution, and others come for research experience. Students working with a Pinelands Station mentor will either participate in an ongoing research project or conduct an individual project that they are able to see from start to finish, become involved in planning, data collection and data analysis. Page last updated by Pinelands Field Station at 11:08 am August 13, 2018 . This page was printed from http://pinelands.camden.rutgers.edu/research/research-opportunities/ at 2:54 PM Thursday, April 18, 2019.